We're open everyday with food, beverages and, most days, musical entertainment. Be proud to show your Moose Membership card to the bartender with your first purchase of the day - every day. Pay your dues, find a Lodge, change your address, this is Moose Central. Keep up with Moose, WOTM & Moose Legion activities throughout the state. Our Moose District has 6 Lodges in SW Florida. Your membership card is good at every one. Discounts on Entertainment, Health & Wellness,Insurance, and Travel. Log-in required. Important notice: The Loyal Order of Moose is a private organization. All activities and events referred to on this Web site and the Moose newsletter are available to members in standing and their qualified guests only. This Web site is for informational purposes with proprietary information intended for members only. General information is available to the public at large, but should not be construed to be a solicitation for membership. 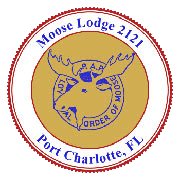 This Web site is an initiative of Port Charlotte Moose Lodge 2121 and is not sanctioned by the Loyal Order of Moose, Moose International or any subsidiary thereof. All logos, trademarks and service marks pertaining to the Loyal Order of Mooseand/or its programs or degrees are copyrighted by Moose International, Inc., Mooseheart, Illinois.